Until scientists, inventors, entrepreneurs, and brave volunteers can figure out how to sustain life on Mars, Earth is our home, but it has a finite number of years left. There’s no way to truly know how much longer our planet will continue to keep the living creatures here alive and well, but us humans have sped up the downward spiral of sand in Earth’s hourglass. Pollution, the biggest problem in the world, of all kinds are wreaking havoc on our planet, and it’s affecting everything from our land, water, and air to humans, animals, and plants – all things great and small meant to sustain life here. Making it one of the main issues we face today. So, what’s causing the pollution, and how does it directly and indirectly affect our environment? And can we do anything to reverse the damage? What Happens if We Continue Polluting Our Planet? What Happens if We Succeed in Reducing Pollution? The curious case of pollution can cause confusion among those who argue it isn’t real, or that it’s a cycle that the planet goes through every few ages – especially when you consider what is polluting our planet. There are five main types of pollution, but it can be broken down even further. 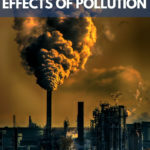 Generally, the five types of pollution are air, land, water, noise, and light pollution. Even if some of these types of pollution don’t sound legitimate, keep reading to find out why they should be taken quite seriously. As the industrial age came about, so did the frequent burning of fossil fuels, such as coal and petroleum. The emissions are damaging the air at an alarming rate, and it makes up for more than 20 percent of the greenhouse gases in the United States. That means power plants, fuel-burning machines, and the use of electricity are all contributing to the pollution of our air. That greenhouse gas is known by another name: carbon dioxide. The number one cause of air pollution is carbon dioxide, and that’s warming the earth. While it’s true that all living things produce this greenhouse gas, it’s also caused by our vehicles, airplanes, and more. The earth can handle the natural emittance of carbon dioxide, but our reliance on fuels has caused the levels to rise higher than they’ve been in hundreds of thousands of years, according to experts. Other causes include methane, which is gas from swamps and livestock. You’ll also see sulfur dioxide listed as a source of air pollution. Before we started contributing to the greenhouse effect, sulfur dioxide mostly came from volcanic eruptions. Those eruptions would spew not only lava, but also plumes of smoke containing high levels of sulfur dioxide, which would block heat from the sun for quite a while and contribute to the cooling of the planet. We’re emitting too much of all the greenhouse gases from the burning of fossil fuels, though, and it’s harming Earth. One of the most obvious effects of air pollution is smog. It’s one result you can clearly (pun intended) see. It’s considered ground-level ozone, which looks like a gray or brown haze that seems to settle over an area. It’s made up of tiny particles, such as smoke, dust, chemicals, and more, mostly caused by greenhouse gases. Not only is smog contributing to the warming of the earth, and essentially climate change, it’s also creating unhealthy air that’s breathed by humans, animals, and absorbed by plants. It can be irritating for your lungs and could exacerbate asthma and allergies for many. You have to think of land pollution a little differently from air pollution. It isn’t just about what we’re adding to cause land pollution, it’s what we’re removing. Deforestation is a big part of how we’re destroying areas of the earth meant to sustain us and other living things. Clearing large areas of land is causing major problems. Landfills are more than an eyesore. They’re filled with garbage that may or may not decompose, and this could cause issues for the soil beneath. Mining is also a major contributor to land pollution. The more we dig, the more we expose and mix materials, which could potentially be harmful to the area and the creatures nearby. It’s hard to argue against land pollution as it pertains to deforestation, after all, without trees, how would we, or any other living being, have oxygen to breathe? The effects of organic compounds used in industrial processes, though, might be even more dangerous. Although many of these materials are naturally occurring, humans are using them in larger quantities, and it can contaminate the soil. That can lead to a decrease in plants, food, and the death of animals. If extinction happens because of land pollution, it can seriously disrupt an ecosystem. There are a few different ways in which we’re poisoning the waters of Earth. One of which is industrial waste, which can include mercury, lead, nitrates, and asbestos. Toxic chemicals are creating a huge threat to wildlife, sea creatures, and plants in various ways. Sewage is also a big problem, as it transfers bacteria and microorganisms that can contribute to water pollution. It’s hard to mention water pollution without pointing out a big cause from the oil industry. Oil spills and leaks can float on ocean waters, and as we all know, oil and water do not mix. Fertilizer is also a big contributor to water pollution, as it travels from yards and farms into bodies of water, and creates problems for the living creatures that rely on clean, fresh water. Aside from the damage that water pollution is doing to our own health (diseasing-causing bacteria), it’s also having a major effect on our ecosystems. Water is life, and when it’s contaminated by algae, it can reduce the oxygen levels in lakes and oceans. The result is suffocation for animals and plants. It’s not only causing death to those living things directly, but to the plants and animals that rely on those others in the food chain. As we dump toxic chemicals that get into our streams, rivers, lakes, and the sea, we’re creating toxicity in the animals we rely on for food, such as fish, and then we have high mercury issues. 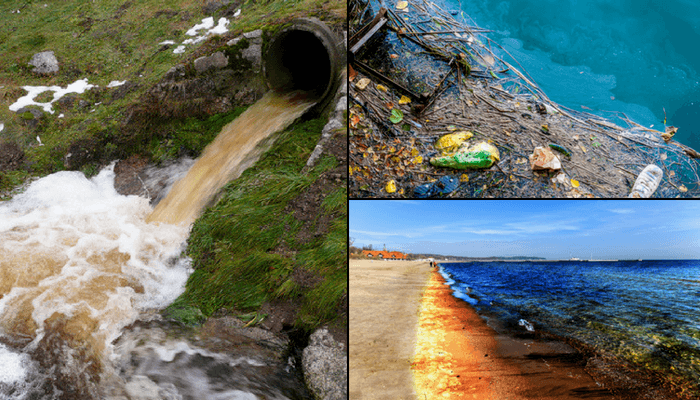 Water pollution isn’t just about the chemicals and sewage, though. It’s also plastics that are strangling sea creatures. And as the ocean becomes more acidic, shellfish and coral are being affected. Without coral reefs, which serve as home for many types of fish and other sea creatures, survival is impacted. Some may argue that noise pollution is an unavoidable side effect of humans progressing and improving technologically, however, it’s causing issues for the earth in a few ways. Noise pollution consists of vehicles, airplanes, and more. Not only are these loud and annoying sounds constant and annoying, they’ve contributed to a surprising effect to at least two species on our planet. Sure, noise pollution is mostly a bother to humans. The sounds of traffic at all hours of the day and night can disrupt our sleep, or just be generally annoying. Noise pollution is also affecting our environment, though. Animals that would normally co-exist with humans are finding new places to call home because of excessive noise. If not relocating, they may be changing their behaviors, which can alter whole ecosystems. Consider how animals find their food, and don’t leave out marine life. Many rely on hearing or sonar to find food, and if the noises we’re making interrupt the natural sounds of a landscape, animals must either adapt or leave. Finally, there’s the issue of light pollution. Again, some skeptics may scoff at the idea that the bright lights of a city could be harmful to the earth, but you should try to keep an open mind. If you’ve ever gone outside to do some stargazing, but all you see is a hazy sky and a bright skyline, you’re being affected by light pollution. Obviously, we need light, so light pollution is considered excess, which is identified as sky glow, glare, and light trespass. Knowing the cause of pollution is just one step in understanding the effects. And ultimately, hopefully, the solution to reducing our contribution to the pollution of Earth as a whole. If you’ve ever lived in a city, you might be familiar with an irritating light pouring into your bedroom window at night while you try to sleep. Although the light might be necessary for the safety of those walking by in the dark, we might be illuminating our cities too much. Not only is light pollution a problem for those who want to get some good shut-eye or people who want to look at the night sky, it’s causing problems for our environment. Think of it this way: We’re all designed to wake with the sun rising, and sleep when it sets. Your natural circadian rhythm isn’t much different from the plants and animals that surround you. So, what happens if the sun never sets? Our artificial lights are confusing many of our fellow living creatures, and they can’t put up blackout curtains to combat the light pollution. For example, coral reefs repopulate once per year after a full moon, but if ambient light blocks the moon phases, it could throw that whole biological event out of whack. The result: Fewer coral reefs, fewer schools of fish, and a whole ecosystem disturbed. Baby sea turtles are having problems with light pollution, too. Not only is pollution affecting our environment, it’s threatening our very existence directly. In 2015, about 9 million people died due to pollution. Air pollutants were the leading cause of death by pollution due to car emissions, coal-burning plants, and indoor contaminants. These types of pollution could cause respiratory issues, heart disease, and strokes. Additionally, waterborne diseases claimed about 1.8 million people, and sickened about 1 billion others. Unfortunately, the majority of the pollution-related deaths occur in low-income countries, or what some call third-world countries. Those aren’t the only ones at risk, though. Consider Flint, Michigan, in 2015, where contaminated water was causing lead-based illnesses in the residents, and especially children. All the leaders of Flint had to do was treat the water to prevent corrosion, or replace the old pipes, but in an effort to save money, that was not done. Fortunately, there are measures we can all take to help reduce the pollution of our planet, whether that’s by air, water, land, noise, or light. You can do your part to help, but it’s going to take all of us being more cognizant of what we consume, and how, to make a difference. To reduce your personal carbon footprint, try living in an area where you won’t need a vehicle. Walk to work, school, and stores to reduce emissions in your neighborhood. When you do need to travel longer distances, consider carpooling, or take public transportation. And if you need a vehicle, consider an electric car as a solution. Another way to reduce emissions is to use battery- or electric-powered lawn equipment. Lawn mowers, trimmers, and other outdoor equipment contribute to about 5 percent of the air pollution in the United States – an hour of lawn mowing is the equivalent of driving 11 cars for an hour. There are plenty of things you can do – or not do – to minimize the pollution of water. When you need to dispose of paint, chemical-based cleaners, or anything else that could have toxins that could affect our waters, be sure you do so properly, and not down your sink’s drain. In fact, try to use natural cleaning products and products with low VOCs (volatile organic compounds). Avoid using pesticides or fertilizers, if you can, as they can wash off and into storm drains, which pollutes our waters. Even properly picking up after your pet after they’ve done their business outside can help, as pet waste can carry bacteria that could adversely affect water. It may not seem like there’s much you can do to stop deforestation, short of chaining yourself to a tree (not suggested), but you might have more power than you think. Recycling does more than keep our landfills a little smaller. You can prevent the need for new landfills, and you can help keep plastic bags and other bits of trash out of the ocean. Obviously, you should never litter, but you can go a step further by picking up what you see when you’re out and about and disposing of it properly. Reducing land pollution is easy when you consider all you have to do is be conscientious. Do you really need to rev your engine when you’re sitting at a stop light? No, you don’t. And that’s just one way you can help lessen the noise pollution in your area. You should also respect the noise level laws when it comes to parties, outdoor concerts, and other events. Buying battery-powered equipment can also lower noise pollution overall, if we all do it. Planting more trees is another effective solution. Studies have shown that having more trees in an area can actually absorb sound by up to 10 decibels. If we all drive a little less, it could have a huge impact on the noise pollution that traffic can cause. Turn off your lights, if they’re not needed. Seriously, it’s as simple as that. If we all turned off lights and appliances with light when they’re unnecessary, we could have a huge impact on the light pollution problem. When light is needed, such as for security, you can reduce light waste by adding a shield to the top of the light to direct the light downward where the light is needed, anyway. This can cut down on ambient illumination of the night sky, if done everywhere, and potentially correct the issue of light blocking out moon phases. As helpful as it is to have regular citizens involved to help turn pollution of all types around, there’s another sector that needs to focus on curbing its use of chemicals, machinery, and other polluting problems. Although there are quite a few holdouts on the whole climate change issue, the fact is that our climate is changing. Climate change is not about temperatures rising everywhere, so hold off on using that argument. Earth’s climate changes constantly, but it’s always been a gradual process, at least until humans started to affect it directly with our technological advances. The planet has cooled and warmed in the past, but the current greenhouse effect is rapidly raising temperatures in areas where it was once much cooler and cooling in areas where it was once warm. To combat this meteoric rise – it’s meteoric compared to the past – some countries that are a part of the United Nations came together to create the Paris Agreement. The point of it is to help mitigate the effects of pollution on our environment and keeping the rise in temperatures as low as possible. The goal is to keep the climb of global temperatures below 2 degrees Celsius, and eventually below 1.5 degrees Celsius. Not every nation has teamed up in this effort, and one in particular joined, then withdrew: the United States. In his first year as President of the United States, Donald Trump chose to jump ship on the Paris Agreement because he decided it was a bad deal, essentially. However, the U.S. may rejoin efforts to combat climate change with the rest of the UN. In addition to being aware of the growing threat of climate change because of industrial processing, manufacturing, and fossil fuel emissions, those in power need to actively change what they do and how they do it to make change happen. Simply turning to wind and solar energy is one effective way a company can reduce its carbon footprint. The fewer emissions a company is responsible for, the better off our planet will be. Corporations can also reduce waste and ensure waste is properly disposed. Even reusing pollutants in the manufacturing process can help combat pollution overall. Another way to minimize the damage done to our planet is for development to be reduced, or at least altered. Relying on other sources for vehicles is another way to reduce emissions, which is why there’s so much focus on finding renewable energy sources to replace fuel. Ideas for Earth Day Projects - here. Consider what the repercussions would be if we did nothing to stop or reduce pollution. Sea levels would continue to rise. Category 5 and stronger hurricanes will obliterate coasts, and even in-land places. More than beachfront property would be affected. Acid rain, which is a direct result of some of our polluting ways, could kill crops. Draughts will dry up crops, too. Land will erode and food supply would be sharply decreased. The death toll related to pollution, such as the airborne and waterborne issues, would go up. The loss of human, plant, and animal life could be devastating. Let’s say we just stopped producing pollutants, such as greenhouse gases. Would we be able to stop climate change? Not precisely. Once carbon dioxide is a part of our environment, it’s there essentially forever. You see, it takes years for everything to catch up, and the climate would continue its climb. Give it about four decades, and Earth’s temperature should finally match what it was before the industrial revolution, in line with its natural increase, that is. It’s not all doom and gloom, though. An increase in temperature is going to happen, and there’s nothing we can about that. However, if we all do our part – governments, corporations, and the public – we can stall climate change a bit. Instead of, say, Las Vegas, Nevada facing average temperatures of 117 degrees Fahrenheit, we might be able to keep it down to 113 degrees Fahrenheit – an increase of only 7 degrees, rather than 11. So, turn off that light in your living room that doesn’t need to be on right now. Bump your air conditioner from 72 to 74. Look into trading in your gas-guzzling sport-utility vehicle for an electric car. Plant a garden, eat less meat, and try to buy local foods. And write to your representative to encourage them to push for cleaner energy and reduced emissions. Every little bit helps if you’re serious about reducing the effects of pollution on the environment, various ecosystems, your planet – your home.